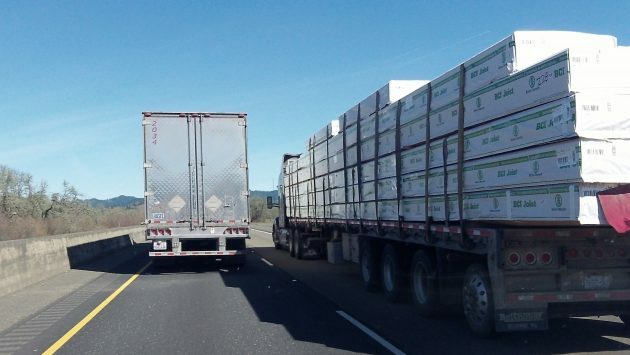 Heading north on I-5 Monday from Southern Oregon: Why truck drivers do that. I don’t know who “Trucker Mike” is, but I’m grateful to him just the same for answers to questions like this one: Why do truckers so often insist on passing each other on the freeway, blocking cars behind them? The answer boils down to this, in my interpretation: They’re trying to make a living, and given the facts of life behind the wheel of semis, they don’t really have a choice. In 2017, Oregon increased the truck speed limit on most of I-5 between here and the California line to 60 mph, up from 55. I thought at the time this would help cut down on trucks passing each other with one going only slightly faster than the other one. But it still happens a lot, it seems. And it irritates drivers stuck behind a passing truck in the left lane that’s going maybe 63 or 64 mph. He explains most trucks are speed-governed between 60 and 65 mph, drivers are trained to drive at a steady speed, and they try to maintain momentum to avoid wasting fuel. So if a rig going 64 comes up behind one going 62, a passing period of a certain length is inevitable. Then, suppose there’s even a small incline that slows the passing truck, so now the two rigs pretty much run side by side. The slower one could slow down more to let the other one in sooner. But getting back up to speed would take half a mile or so and burn up extra fuel. What about semis swinging into the left lane just ahead of cars behind them? “It’s isn’t because they are trying to prove a point to you or simply trying to be a jerk,” Mike writes. It’s because if they hit the brakes and lose momentum, it will take them a very long time and extra fuel to get up to speed again. It’s worth remembering that semis get around 5 miles to the gallon, and filling the tanks may cost up to a thousand dollars. That’s why in trucking, not wasting fuel by repeatedly having to regain lost momentum is part of the job. AOC and Bernie say we’re all dead in 12 years if humans don’t cease using fossil fuels. Given these truths, abolishing ICE will be a necessary first step. I expect President Bernie to declare this ban on Jan 21, 2021 via emergency declaration. After that, we can swear at self-driving electric semi’s that make irritating lane changes. And I doubt the smart trucks will know what to do when Hasso blinks his lights at them. Wink back, perhaps? My life coach (Oprah) is working overtime to make me feel better about this future world. She keeps mumbling something about “new beginnings”…. Extinction thanks to AI. Lock trucks to a single lane. Use computer intelligence to keep All trucks separated from one another by at least 20-truck lengths at All times. I don’t care about truck mileage adding a percent to somebody’s bottom line. I don’t care that it takes a long time to rebuild speed, particularly when the truck is exceeding the posted limit. Trucking companies ought to be forced to build their own roadways, thereby freeing us from the tyranny of these bestial creatures. You sound like Ocasio Cortez. Your Folks must be proud. By Trucker Mike’s assessment, all other variables are secondary to vehicle mileage. Hummmm! Not quite. Just a key driver in the answer to the passing question. Cost and adherence to schedule get callbacks. The speed limit is 60. If they all go 60 they don’t need to pass each other. If they want to speed and pass each other then they need to do so quickly. If it’s not a requirement for passenger vehicles, why should it be a requirement for commercial transports? I drive I-5 everyday…semis have just as much right to the left lane as passenger vehicles. I give total respect to these Kings (and Queens) of our nation’s highways and by-ways and whom without, we wouldn’t have the fuel to drive our own vehicles, or groceries in our cupboards or electronic devices to play with. If you can’t give a trucker a couple of miles, then maybe you should leave home a little earlier. This is good information for when they’re on an incline, although most of the time when they’re passing each other it’s on flat terrain and they are going roughly the same speed, so this logic generally wouldn’t apply. I’d be curious to hear what the explanation is for when they’re not on an incline.